The Pacific Blue Tang became famous with the release of the movie "Finding Nemo". Nemo's traveling mate was Dory, a Hippo or Pacific Blue Tang. Ironically, in the wild (and even in an aquarium), the "Dory fish" acts very much like the movie character, seeming to have a short memory span and flitting all over the place. The producers did an excellent job of researching the characteristics of this fish when writing the movie. It's important to know, however, that Pacific Blue Tang are not easy fish to keep, and are certainly not suitable for children. Common Name Pacific Blue Tang, Hippo Tang, Blue Regal Tang, and Palette Surgeonfish. Also recognized and known as "Dory", the fish in the Disney movie Finding Nemo. Origin Native to reefs across the Indo-Pacific. Adult Size 12.2 inches (31 cm). The Pacific Blue Tang hails (not surprisingly) from the Pacific Ocean, but can also be found in the Indian Ocean, ranging from East Africa to Micronesia. They've also been sighted in the Seychelles, Madagascar, the Marshall Islands, southern Japan and the Great Barrier Reef (Australia). They prefer coral reefs and rocky areas near the coast and are usually found at depths of 6-131 feet. Pacific Blue Tangs have oval-shaped bodies and sharp spines along the sides of their scales. These scalpel-shaped spines (which earn the fish the name "surgeonfish") are usually kept flat along the fish's body but pop out when the Tang is threatened. Any predator in range of the Pacific Blue Tang's tail will get a face-full of spines. The caudal spine also contains a toxin that can injure or kill other fish (depending on their size). These fish change appearance as they mature. Juveniles are yellow with blue spots near their eyes; their fins have light blue tips. Over time, the fish's body becomes dark blue, with dark lines running lengthwise. Their tails and pectoral fins are bright yellow. 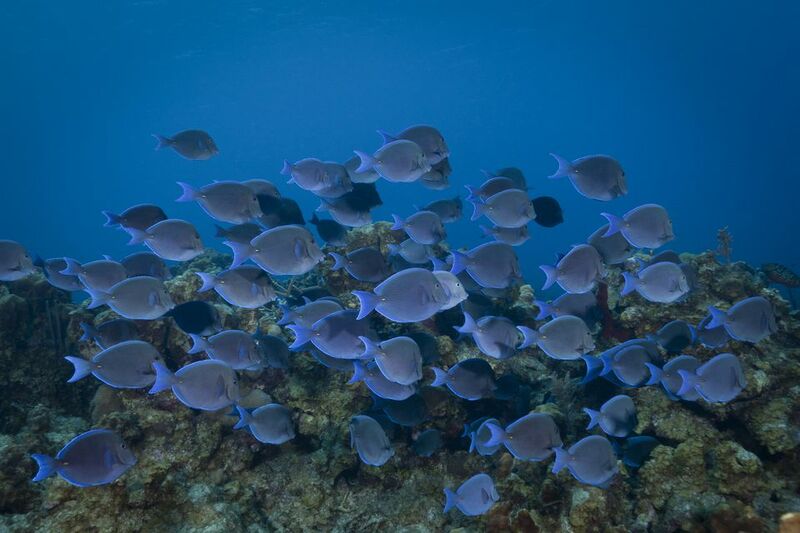 Pacific Blue Tangs are not the most sociable of fish and can be combative with one another. You can lower the risk of aggression by introducing several at the same time and providing them with a very large tank; otherwise, it's best to keep only one at a time. In general, Pacific Blue Tangs should also be kept away from all other surgeonfish. They can do well (as in the movie) with Clownfish, other peaceful fish, and invertebrates. The Pacific Blue Tang is very active, requiring a large tank, preferably at least 100 gallons or more. It enjoys grazing on live rock and needs highly oxygenated water which can be provided through increased surface agitation or air stones. This species is not overly aggressive towards other tankmates but may become boisterous in the community. Juveniles can be kept together in groups, but adults will fight unless ample shelter and swimming room are provided. Be sure to have plenty of hiding places for them to retire to when they are challenged by other Blue Tangs. The Pacific Blue Tang will find the oddest hiding places. It will, quite often, stick its head into a crack in the live rock with its body sticking out and believe that it is entirely hidden. It will also lay flat on the substrate, thinking it is hidden, and allow itself to be physically picked up without a struggle. Like most Surgeonfish, the Pacific Blue Tang is prone to contracting ich and susceptible to head and lateral line erosion (HLLE). Unlike most Tangs or Surgeonfish that require a steady diet of algae, the Pacific Blue Tang should also be fed meaty fares to satisfy its zooplankton dietary needs. Finely chopped fresh or frozen shrimp, mysid shrimp, brine shrimp, and preparations for herbivores are suitable foods, as well as nori (dried seaweed) is accepted. To help with healing of HLLE problems, foods can be soaked in a liquid vitamin supplement, such as Selcon, and Kent Marine Zoecon. The male and female look very similar, but the male is typically larger. Two males in a tank may often fight one another, using their sharp caudal fins. It's not easy to breed the Pacific Blue Tang in an aquarium tank. That's in part because their breeding habits require a coral reef. At breeding time, Pacific Blue Tangs get together in breeding groups. After the females expel about 40,000 their eggs into the water above a coral reef, the males swim through the "cloud" of eggs expelling sperm and fertilizing the eggs. Once fertilization is complete, both males and females swim away; the offspring are left to fend for themselves. One day after fertilization, the eggs hatch. The larvae in a plankton "soup" for a period of time, feeding and growing until they are ready to metamorphose into juvenile Tang. As they go through this change, they change their habitat, settling into the coral reef. Juveniles mature while living in the reef, growing and changing both their appearance and their habits. Pacific Blue Tang can live as long as 30 years in their natural habitat.